With his mom being a cinematographer and sister being an actress, Victor Gilbert’s impressions of movies are quite different than most children his age. He doesn’t just see something to entertain him, he understands the whole filmmaking process, and has for most of his life. At only ten years old, he can navigate a film set and understand the intricacies of what is required to make a film like many much older. That is perhaps why he already knows he wants to spend the rest of his life acting, and he is in demand not just in his home country of Canada, but internationally as well. Gilbert’s career is already very formidable. Just this year he worked on a powerful commercial for Alberta’s public service union AUPE, and his film The Kiss has made its way to several prestigious film festivals. He has starred in five seasons of Netflix’s hit series Hell on Wheels, and even with this, he feels like he is just getting started. “I would really like to be an actor full-time when I grow up and don’t have to be in school,” said Gilbert. Despite not being a full-time actor, Gilbert is still quite the professional. Just last year he starred in the film The Walking Man. The film tells the story of a man who is compelled to leave his job and become a homeless wanderer. His friends and acquaintances share their opinions, and audiences are left to ponder his purpose. 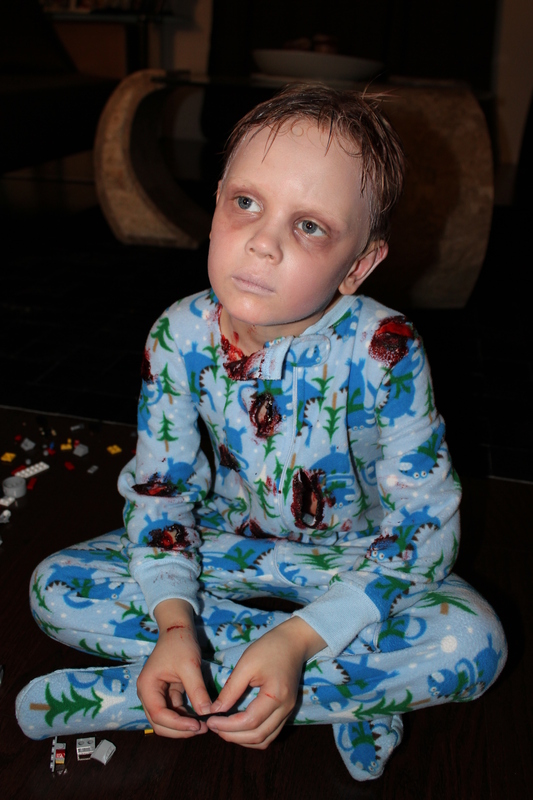 In the film, Gilbert plays Eric, one of the principal children who talked to the camera about “The Walking Man”. Eric was once a player for the soccer team that The Walking Man coached prior to quitting and abandoning his life. Having a child’s perspective about why the man began wandering was essential to the story’s development and how audiences felt about the entire concept. Eric is a young boy who loves to play video games and doesn’t really take his attention away from his game when he talks. He is a ‘rough’ boy who is not very interested by what is going on with his old coach. He is asked to speak about what he saw, but doesn’t really want to since he’s so busy with his games. The disinterest in such a unique showcases a child’s innocense, and required a talented young actor to embody such a character. This is where Gilbert shined. “My mom says many adults, like the main character of the movie, question themselves and their lives at some point, so the topic is very accurate and recurrent and impactful. It’s not always easy to deal with all the bills, and many people probably feel like they want to quit. It’s good because it teaches everybody that they are not alone and there are options and people out there to help. Maybe it’s important to take pauses in life to stop and relax and just walk, and it’s ok. Basically, don’t stress about things, and ask questions in life,” said Gilbert. The Walking Man had its premiere screening at Orange Lofts Condos in March of last year, and now is making its way to film festivals. It was previously selected for the Winnipeg Real to Reel Festival, and the Central Alberta Film Festival. It is expected to have screenings at even more festivals soon. Such success may not have been possible without Gilbert’s portrayal of Eric. He had many lines throughout the film, and he had to stay very serious. He was only 8-years-old when the filming took place, and this is no easy task for someone of that age. However, Gilbert understood the importance of his character, and even learned the whole script by heart to comprehend the story’s importance. He then did his entire scene in just one take. Selinger, a well-known magician, knew Gilbert was the right person for the role in his film. Gilbert had to sit on the couch and play on a Nintendo GameBoy, and then talk to the camera. While saying his many lines, he always stayed in character and very serious. He describes The Walking Man and what his character saw, and does so in a confessional sort of way. Such a style requires extreme focus, as the camera sees every aspect of your face. It also requires a rawness, as the scene had to present in the style of a documentary interview. With the distraction of the video game console, this could have been difficult for many child actors, but Gilbert embodied it perfectly. Besides, for the young actor, this was a dream come true, as he still got to play video games, something he already enjoys. “Derek is just really nice. He is not stressful, he helps his actors and makes the set very comfortable. He takes his time to explain the set, he is all prepared already when we show up on set, so things go super fast. Like, the fastest I have seen,” Gilbert described. However, even though he got to play video games and work with people he liked, the best part of Gilbert’s experience shooting The Walking Man came from an unexpected source. “Derek is a magician. A real magician! He does shows on big stages. So, he is a very interesting person. He does magic tricks sometimes on set,” said Gilbert. Check out the tralier for The Walking Man here. When most parents ask their child what they would like to be when they grow up, they often expect to hear answers like “actress” or “singer,” and simply hope that the novelty will wear off with age. For Anna Pniowsky’s parents, however, this is not the case. Not only does Pniowsky have a burning passion to be an actress, she is not ready to wait until she’s an adult. At the young age of 12, Pniowsky is proving to be a force to be reckoned with in the entertainment industry, and she is certain that this is what she wants to be doing for the rest of her life. For Pniowsky, acting provides her with a platform to unleash her creativity, and it is an outlet to transform herself into each new role that she takes on. She loves all aspects of her job, and she soaks up any opportunity to learn from other professionals every time she steps on set. From camera operators, to hair and makeup, she will stop at nothing and at no one to expand her knowledge and skills in the acting world. Knowing that she has an opportunity to evoke unfamiliar emotions from her audience is what motivates her to keep her head down and focus on her craft, something which she aims to continue doing as she builds her career. When asked about what initially lead her to the idea of becoming an actress, Pniowsky cannot pinpoint an exact moment. For as long as she can remember, acting has been a world that she was drawn to and that passion has only ever grown with time. Despite her age, Pniowsky has already won herself lead roles in films working with well-known cast members and directors, such as her lead role in Light of My Life, for which Pniowsky was directed by and co-starred with Oscar-winner Casey Affleck. When she sets her sights on a role, there are few limits to what she can achieve and she immerses herself into roles in ways that some established actors and actresses could only admire. Pniowsky is wise beyond her years and she has pieced together a remarkable career path very early on in her life. At the mere age of eight, Pniowsky landed herself her first ever role in the film Wait ‘Till Helen Comes. The film, which can also be known as A Little Girl’s Secret, is about a reconstructed family who moves to a converted church in the country. When a 14-year old Molly realizes she has a gift that she must use, she has to face her deepest fears and save her troubled step-sister from a dangerous relationship with the ghost of a lonely little girl. In this role, Pniowsky played the powerful role of a young girl that goes missing, walks into a river and drowns. Her character was instrumental to the horror film’s plot line and needed to be played by a highly attuned actress who would know how to keep with the atmosphere and the mood of the storyline. By walking into the river and drowning, Pniowsky’s character helps the audience to draw the chilling conclusion that the story’s antagonist, Helen, targets young girls and leads them into the river to drown. Pniowsky set the scene for the entire film, and without her talents, the film would not have earned the reputation that it did. As a learning experience, Pniowsky could not have asked for more. Not only did she gain exposure to working with other actors on set, as well as taking direction from a vetted production crew, Pniowsky also gained experience shooting a physically and psychologically demanding scene. She was tasked with shooting the film’s opening scene in close to freezing water. The water was so cold, in fact, that she was immediately pulled from the water and placed in a hot tub when the scene wrapped in order to ensure that there was no damage done to her body from the cold. Pniowsky handled the tasking scene with a high degree of professionalism and ease. Even when there was a flaw with the camera, and she was asked to shoot the scene again, Pniowsky got back into the character and executed the scene flawlessly for a second consecutive time. Victoria Sanchez-Mandryk, who produced Wait ‘Till Helen Comes, was shocked to experience the caliber of acting that she received from Pniowsky at such a young age. She learned very quickly that Pniowsky’s acting skills rival that of highly experienced actors and actresses who have dedicated a lifetime to their craft. According to Sanchez-Mandryk, “Anna is like an old soul, who quietly watches and listens with wisdom beyond her years, taking everything in. When action is called, she delivers in full force.” To receive such high praise from a professional like Sanchez-Mandryk is not a small feat. For Pniowsky, however, it simply motivates her to continue mastering her artistry and showing the world what she is capable of. As Pniowsky patiently awaits the release of Light of My Life, she continues to search for new ways to challenge herself and push her acting abilities to the limit. She considers herself extremely fortunate to have earned the experience that she has earned thus far in her career, but aims to build on those successes for many years to come. Keep an eye out for Pniowsky as she continues to rise to the top.